Once there was a time before mortgages, student loans and income tax. A time when life consisted of summer holidays and winter snow days…when a cardboard box was a space ship and a Radio Flyer wagon might get you to the moon and back in time for dinner. It was a time when imagination was in charge of reality and adventures happened every day. At least, if you close your eyes and see those things you’re probably Steph Jeavons. 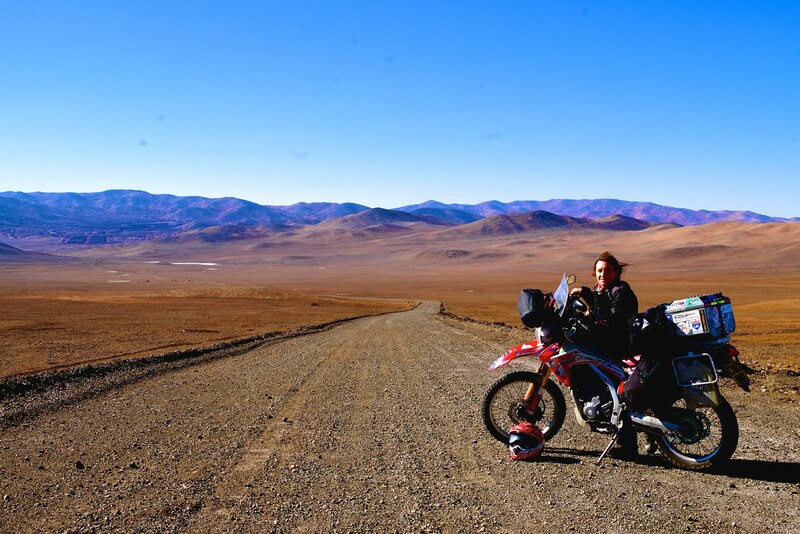 And those imaginings, and dozens more, started out as a dream of riding her motorcycle around the world. A dream that has unfolded over the past 26 months and 52,000 miles into her reality. Steph doesn’t have a big inheritance, a fat trust fund or even corporate sponsorship. What she does have, however, is an authentic curiosity and genuine sense of wonder that characterises not just this particular adventure, but her life in general. Steph lives with open hands and an open heart and while she cheerfully admits that she’s no stranger to fear, she’s determined to let her imagination—and her dreams—determine her reality. 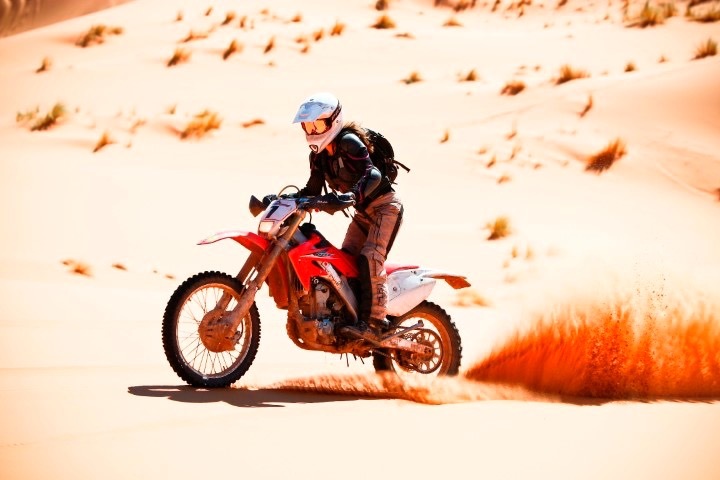 Throughout, Steph has been committed to connecting with people who are passionate about riding, or eating, or drinking, or music, or cars, or dreams—indeed, people who are passionate about living. These consequently find themselves connected not by language or politics; but by a thread of hope attached to a Honda CRF 250 that left the Ace Café in London on March 23, 2014. A dedicated supporter of Rally 4 Life, Steph has spoken internationally at a wide variety of events and venues. Join Steph on the final half of her journey around the world—she is always looking for places to get off the beaten path and might soon be coming to a community near you. Do not miss this unique opportunity to be inspired to remember your dreams. Follow or contact Steph at One Steph Beyond . If you’ve ever had a red Radio Flyer wagon, or played in a cardboard box, this is a woman you’ll want to meet. 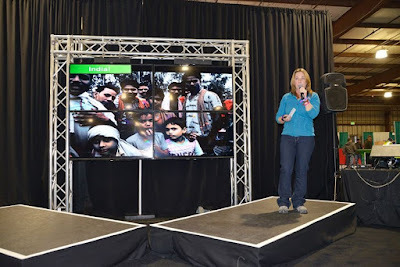 It was a pleasure having Steph Jeavons come to Bend, Oregon to present her travels to an enthusiastic crowd of riders, travelers and adventurers. We received 100% positive feedback from the audience, and several people have expressed how inspired they are to venture farther outside their comfort zones after hearing Steph speak. Steph's presentation strikes an excellent balance, being both entertaining and informative. Giant Loop highly recommends booking Steph Jeavons for your event! I had the pleasure of meeting Steph Jeavons at the 2016 Timonium Motorcycle Show, held in Timonium, Maryland, February 12th, 13th & 14th. The show has the reputation of being one of the largest, most diversified bike shows on the east coast. She was an important part of our second annual Expanded ‘Travel, Touring & Adventure Feature Area’ which consisted of the international ‘who’s who’ of long distance adventurers…sharing stories, tips and support to many of our two wheel enthusiasts who were ready to take their short trips to the next level! I communicated with Steph over a 6 month time frame, via emails, to organize her needs (i.e. travel, hotel accommodations and details of her presentation, etc.) while at the show for the three days. She was organized, detailed and delightful to work with! She helped make the ‘Travel, Touring & Adventure Feature Area’ another huge success! 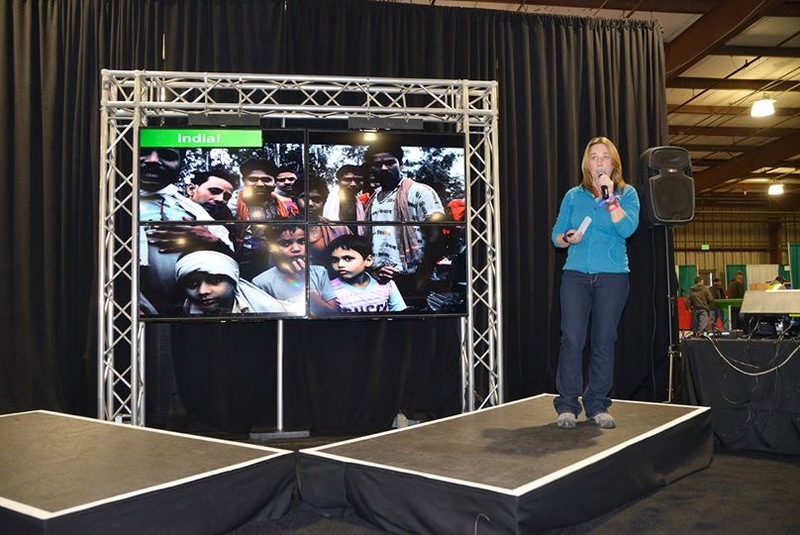 Her presentations, describing her travels, held our attendees in their seats and hanging onto every word. She was fun, professional and interacted with the audience at the stage and in her booth all three days from open to close. I look forward to working with her again at the 2017 Timonium Motorcycle Show!